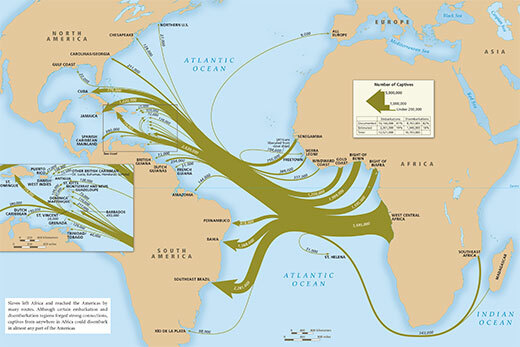 Available for download on www.slavevoyages.org, this map summarizes and combines the many different paths by which captives were taken from Africa and transported to the Americas. David Eltis: "Atlas of the Transatlantic Slave Trade"
Emory University has been awarded a grant of $300,000 from The Andrew W. Mellon Foundation for use by the Center for Digital Scholarship (ECDS) to fund a new initiative allowing researchers at Emory, across the U.S. and abroad to update and expand the renowned website Voyages: The Transatlantic Slave Trade Database hosted at Emory. The new project, called “People of the Atlantic Slave Trade” (PAST), will provide information on any historical figure who can be linked to a slave voyage, enslaved and enslavers alike. “We are proud to house this project at Emory and grateful for support from the Mellon Foundation, which advances our efforts to make this extensive research publically available, broadening its reach and impact,” says Dwight A. McBride, Emory provost and executive vice president for academic affairs. PAST brings together the work of 21 scholars whose expertise matches the geographical range of the transatlantic slave trade, says David Eltis, Emory professor of history emeritus and co-director of the project. “PAST will create a biographical database of all those who have a documented link to any of the voyages in the transatlantic slave trade database, whether as an enslaved person, an African seller, a buyer in the Americas, a ship owner or a captain,” Eltis says. PAST will be incorporated into www.slavevoyages.org and will be accessible to researchers and the public via its own interface. “The existing voyages-based database already contains the names of 30,000 slave ship captains and ship owners, as well as 91,000 enslaved Africans,” Eltis notes. PAST will add to this list as well as augment it with basic biographical data on those already in the database. “Overall, this newest phase in the evolution of slavevoyages.org will allow scholars to examine the organization of the traffic, locate the social background of those involved (enslaved and enslavers), make new assessments on the trade’s impact and relative importance, and eventually to develop new explanations of why a race-based Atlantic slave trade evolved, why it endured for 340 years and why it ended,” he says. Since its online launch in 2008, www.slavevoyages.org has become a widely used reference tool for the study of slavery in the Atlantic world, says Allen Tullos, professor of history, project co-director and co-director of ECDS. “Voyages is a major digital scholarly publishing project,” says Tullos. ECDS provides the home base for the project as well as managing its logistics, technical backup and sustainability over time. Currently, ECDS is completing a re-coding and redesign of the Voyages site that will debut soon. By mid-2018, www.slavevoyages.org also will offer a new database comprising 10,000 intra-American slave voyages that occurred within the Americas, usually carrying recent survivors of the middle passage. “Half of all disembarking captives faced a lengthy second journey after the middle passage,” says Eltis. “For over a quarter century, David Eltis's Transatlantic Slave Trade Database has been the ‘Gold Standard’ in the field of the study of the slave trade,” says Henry Louis Gates Jr., Alphonse Fletcher University Professor and director of the Hutchins Center for African and African American Research at Harvard University. “It has transformed what we know and how we think and write about the forced removal of 12.5 million Africans to the New World, and the 10.7 million who survived the horrors of the Middle Passage. No scholar can undertake a serious study of that process without consulting it. Since Voyages’ inception in 1992 as a CD-ROM, the project has received funding of more than $3 million. In addition to Mellon, the project has received support from the National Endowment for the Humanities, the W. E. B. Du Bois Research Institute at Harvard University’s Hutchins Center, and the Arts and Humanities Research Board of the United Kingdom, administered through the University of Hull in the U.K. 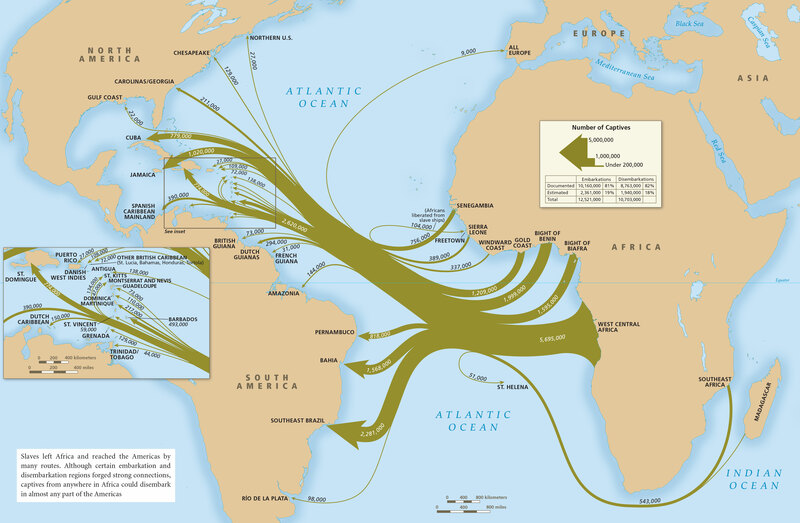 In 2010, maps generated by the project were published in print form as the “Atlas of the Transatlantic Slave Trade,” co-edited by Eltis at Emory and David Richardson of the University of Hull. The Gilder Lehrman Institute of American History funded the book’s publication to bring the atlas to a wider audience, including teachers, students and the public.